Bees do it. Frogs do it. And now scientists fear bats may be the next die-off victims. Something is killing off the bats in Northeastern United States and scientists are racing to find the culprit. A mysterious ailment affecting colonies of hibernating bats — first reported in the winter of 2006 — is spreading, raising serious concerns for scientists and conservationists. First observed among bats in caves and mines in New York, the phenomenon has wiped out 75 to 100 percent of the individuals in the colonies where it has occurred. The die-off has spread to the neighboring states of Connecticut, Massachusetts and Vermont. According to the U.S. Geological Survey, 100,000 bats of numerous species have been killed in the outbreak at 18 sites; the USGS says symptoms of the illness have been reported elsewhere in the region. 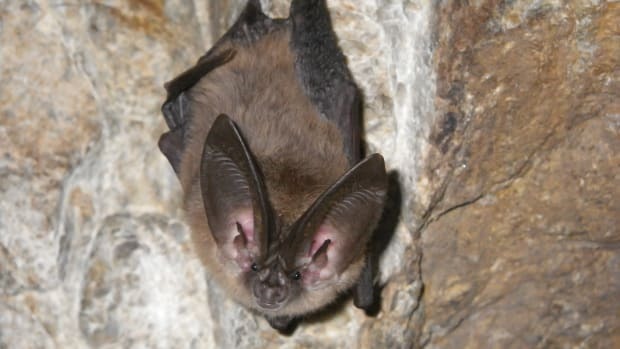 The affected species include some of the most prevalent bat families in the Northeast, among them the little brown bat, the northern bat, tricolored bats and small-footed myotis, as well as the Indiana bat, which is already on the endangered species list. The dead and dying bats show evidence of an emergent infection characterized by a white fungus that grows on the bats&apos; muzzles while they rest in their caves over the winter. Bats play a critical role in human health, devouring huge quantities of mosquitoes that could be carrying dangerous diseases like West Nile virus, but ecologists note that bats also play a central role in plant pollination and seed dissemination. Adding to scientists&apos; fears about continued drastic losses in bat populations is that mature female bats give birth to just one pup per year, making it unlikely that decimated populations would rebound quickly. This week researchers announced the discovery of a previously unknown fungus, dubbed white-nose syndrome, which they believe might be responsible for the malady. David Blehert, head of diagnostic microbiology at the USGS&apos; National Wildlife Health Center in Wisconsin, isolated the fungus and identified it as a member of a group known as Geomyces. Blehert was the lead author of the paper on white-nose syndrome appearing in the journal Science. This class of fungi lives in soil, water and air, and it thrives in the refrigerator-like conditions in the caves where bats sleep through the winter. "We found that this fungus had colonized the skin of 90 percent of the bats we analyzed from all the states affected by white-nose syndrome," Blehert was quoted in a release from the USGS. "Data show the occurrence of white-nose syndrome radiating outward from the site of its first appearance and the genetic identity among fungal isolates from distant caves argues for the recent introduction of this microbe." If the fungus is killing the bats, it follows the footsteps of chytridiomycosis, a fungal skin infection blamed for the population collapse in frogs worldwide. The constellation of symptoms seen in the bats, however, has researchers puzzled. Most of the sick bats have been found in an emaciated condition. In addition, dead and dying bats have been found at or near the entrance of their caves, recalling the recent phenomenon of colony collapse in honeybees, where dead bees have been found in the vicinity of, but not within, their hives. Observers have also noted aberrant behavior by sick bats: They emerge from hibernation to forage during the dead of winter, when no food is to be found, only to return to their caves exhausted, dehydrated and disoriented. These observations have led to speculation that the fungal infection might not be the primary agent causing the bats&apos; demise, but rather it may be an opportunistic infection arising from some other underlying condition. "It&apos;s still a question whether the fungus is the direct cause or a secondary symptom." said Anne Ballman, veterinary officer with the National Wildlife Health Center. Ballman said it has been hypothesized that environmental changes may be behind the outbreak. Widespread application of pesticides may play a role by depleting the bats&apos; normal insect prey populations, she said, forcing the bats to go into hibernation in a malnourished and vulnerable state. "Prey-base counts are something that researchers are investigating, along with other studies to detect any evidence of toxic levels of pesticides in the bats," she said. Researchers are exploring the possibility that the disease may be spread by humans visiting the bats&apos; roosting sites, potentially transmitting the agent from colony to colony as they explore the caves and mines (http://www.necaveconservancy.org/default.php) where the bats winter. The USGS has issued a call for research proposals to investigate the cause of the die-off, while the organization Bat Conservation International has requested members of the public to report the location of sick and dying bats, in an effort to track the progress of the disease. Though the exact cause of the ailment has yet to be found, Ballman said she has heard anecdotal reports that afflicted bats have been nursed back to health through the "fluids and nutrition" protocol. But Ballman cautioned the public not to handle bats: "That requires a permit and should only be done by experts." A fungus long suspected as the cause of the white-nose syndrome killing American bats has been positively ID'd as the culprit. A fungus linked to widespread destruction of U.S. bat colonies has been found on a thriving French bat. Biologists have little idea where many of Colorado's bats reside. Athletes are helping. With white-nose syndrome continuing to plague North American bats, the federal government is sending some academics to the rescue.